BOOK YOUR FIRST SNOW KITE LESSON NOW! Intermediate on skis or snowboard*, Age 12+. The most important level of instruction. The goal of this clinic is to teach you the critical basic kite skills and knowledge you need before you begin moving on your skis or a board. You will learn to fly depowerable 4 line kites as we teach you about general kite selection, set up, safety and flying. You'll set up a kite, become familiar with it's safety systems, how to launch, fly and land the kite. And, although the Beginner Snow Kite Course is intended primarily as ground school with a focus on learning the basics of safe kite flying, if you are a fast learner we often get you some time moving on skis under kite power. *As each lesson description states YOU MUST BE AN INTERMEDIATE SKIER OR BOARDER. Ski/board instruction is not within the scope of our lessons and basic knowledge of how to edge a ski or board is critical to your success. 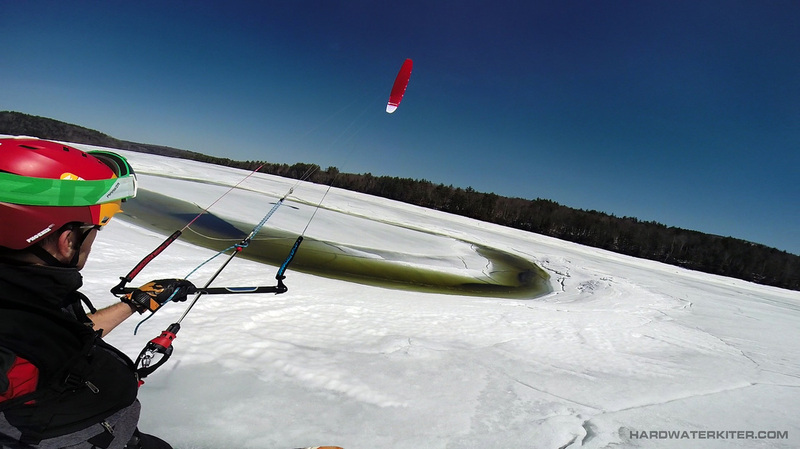 Any time spent instructing ski/snowboarding is time that is taken away from your kite instruction. There are many ski schools in the Mount Washington Valley that can get you up to speed on the skiing skills required to effectively learn to snowkite. ** CANNOT BE COMBINED WITH ANY OTHER OFFERS.